Do you want to protect the content of your PDF document from being copied, being extracted or being edited? Let PDF Freeze help you! 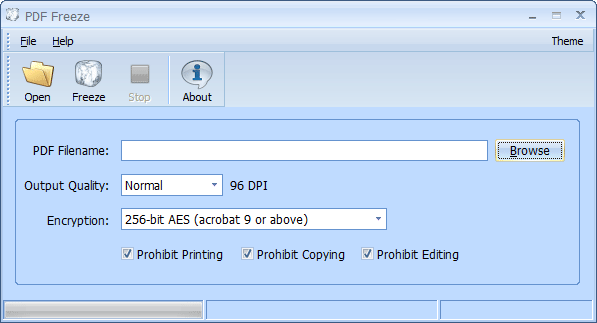 This freeware can convert common PDF (including text and image) to image PDF. Yes, there is no text in the output PDF document at all and all pages are converted to images. The converted image PDF can be read like before by any PDF reader, but there is no text for copying, editing or extracting! PDF Freeze allows you to change the image quality. For example, if you want to send a demo PDF to the user for preview purpose only. You may set the output quality to low. Besides, to make your PDF document more secure, this freeware supports 40-bit RC4, 128-bit RC4, 128-bit AES and 256-bit AES Encryption. There are 3 options for you to choose: Prohibit Printing, Prohibit Copying and Prohibit Editing. Convert common PDF to image PDF. 256-bit AES Encryption is supported. Does NOT need to install Adobe Acrobat software. 2. About 10 MB of disk space for installation.